Knightwood Oak the most famous New Forest tree? 600 years of New Forest history. 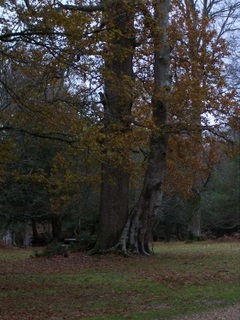 We have visited the Knightwood Oak in the beautiful New Forest National Park at numerous times. The gravel path from the car park winds past some young memorial oaks which are saplings (young plants) from the old tree itself. This area is known as The Knightwood Enclosure and is a forestry plantation. This tree is possibly 600 years old and so was here long before the plantation. The old oak has been fenced in to protect its roots from our trampling feet. This is what is called a "cleft oak" fence and as you approach the ancient tree you will see information boards, not only on the Knightwood Oak, but also on why this type of fencing is used. You can follow the carved wooden path signs like this, around the enclosure. 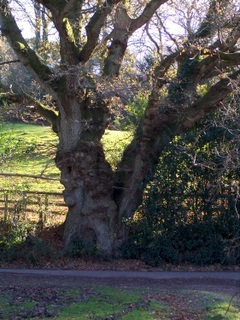 Why is the Knightwood Oak so famous? Well, apart from being 600 years old - imagine what it has seen, just standing in the forest all those years. It was around at the start of the Tudors and has been there ever since. The area around its girth (middle) is seven and a half metres! which is large by any standards. Why is it the shape it is? It is a "pollarded" tree. This is like many of the really old trees in the forest. Pollarding was done to a tree by cutting off its head or top part when it is a young tree. This encourages new shoots which are then out of reach of grazing animals. More importantly, to the Commoners and Foresters, it would have provided them with a supply of fuel from these new shoots. 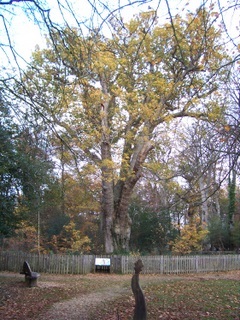 There is an information board at the site which described the ancient tree as a hotel due to the number of "residents" it has, making use of its huge frame. You may hear a Woodpecker drumming away at it - I find it hard to believe every time I hear this bird at work that a small head can make so much noise, at such a tremendous speed - I can't imagine how strong its brain must be to take such a vibrating bashing! In the autumn you will see various fungi sprouting out from the branches. The New Forest is a really good area to see fungi as it it quite a damp habitat and fungi grows well here. Apart from the spectacular and ancient Knightwood Oak I found two other really fascinating trees at this site. See what you think when you visit. The first one (or two!) to see is just before you get to the fenced enclosure. Two trees, an old Oak and an old Beech have "fused" together. This is called "inosculation" (from the Latin "to kiss") and is a rare occurrence in the New Forest. I thought this was a really spectacular sight and I have never seen it before - have you? The next amazing tree was beyond the old oak where the trees were closer planted. 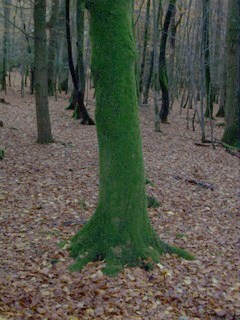 A pair of trees here have a rich green moss growing all over their trunks. This was a really tactile sight and I couldn't help just gently touching it. 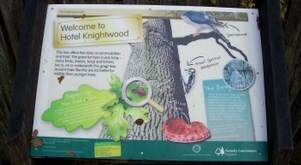 Have you decided to visit the Knightwood Oak. There's a handy car park opposite the site and if you buy OS Explorer 22 before you visit you have a really good walk around the area and get the feel of the New Forest too! When we got home from the trip I thought of an ancient old tree near where I live. It hasn't been pollarded, at least not as much as the Knightwood Oak, and so has been left to grow more in its own way. The size of it is quite spectacular and whenever it is windy we all take care walking near to it - a big bough did break off last winter which blocked the road for a while - what do you think? If you want to search New Forest Life.com without using the navigation bars on the left, then here's a really useful Google tool. Just put your search details e.g. New Forest ponies in the search box and hit Search and you can choose to search my site or go onto the Web and come back to NewForest-Life.com. Perhaps you have some questions or comments to make? The Contact Form is there for you and I promise your email address is never passed on to anyone by me - it is only a way to comment back to you. I promise I will not pass on your email details to anyone else - I'll only use it to reply to you. 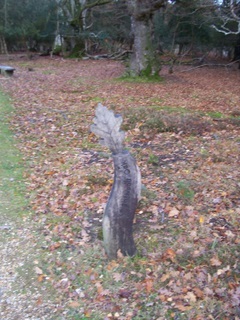 I hope you enjoy your visit to the New Forest Knightwood Oak tree. You will be in an environment as soon as you arrive within this UK National Park where there are huge, fascinating trees with lots of history wherever you decide to go!